In 1950s America the men are back to work and the women are home raising a new generation. The war is over and the boom is on. Everyone is happy. It is to this myth of the perfect American family that novelist Margaret Millar applied her scalpel. This volume includes five of Millar’s novels of the 1950s, among her best-known works of literary suspense as well as some of the most compulsively readable, please-leave-a-light-on thrillers ever put to paper. In this classic noir tale of blurred guilt and flawed innocence, a cynical lawyer uncovers the desperate lives of a group connected only by a gruesome murder. A sincere and compassionate novel about the complications of married life, and the love, loathing, pain, loyalty, disappointments and friendship that grow out of a marriage. When Ron Galloway never arrives at a boys' weekend fishing retreat, it becomes increasingly clear that something terrible has befallen him. Was he a victim of his own lust? Or of someone else's greed? In this suspenseful masterpiece about corrupted love, Rupert Kellogg's wife, Amy, goes missing after an ill-fated trip to Mexico—and Rupert becomes the focus of a paranoid investigation. "Millar's mysteries are filled with clever twists, yet what makes them special is her surgical approach to her characters' inner lives. She's got an eagle eye for the juicy stuff lots of mystery writers still ignore—questions of class, status, sexual desire and the difficult position of women. This last was something she knew about firsthand. Millar's work was long overshadowed by that of her husband, detective novelist Ross Macdonald. In fact, her best novels — like 1955's Beast in View — have a ferocious edge that make him look rather tame." "One of the greatest this country has ever produced." 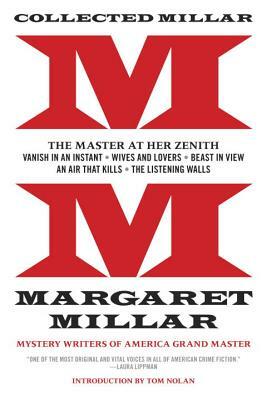 "[Millar] writes with care and devises clever plots, holding back plenty of surprises until she is ready to let the reader know... She exhibits a virtuoso talent for creating distinct identities for her characters, even if they might have more than one identity." "A writer whose own work is every bit as psychologically bruising and critically acclaimed as that of her husband [Ross Macdonald], if not as well known. But [Syndicate Books] hopes to rectify that with Collected Millar."